Bill for grocery items from The W.H. Malkin Co., Limited, importers, wholesale grocers and provision merchants, for [Mrs Seidleman] of Cedar Cove, B.C. Bill is issued on October 15, 1908. 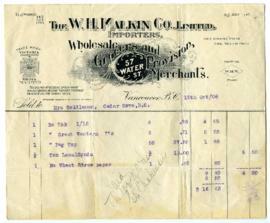 Bill for grocery items from The W.H. Malkin Co., Limited, importers, wholesale grocers and provision merchants, for [Mrs. Seidleman]. Bill is issued on August 13, 1908. 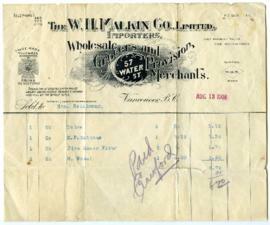 Bill for grocery items from The W.H. Malkin Co., Limited, importers, wholesale grocers and provision merchants, for [Mrs. Siedleman]. Bill is issued on April 28, 1908. Bill for grocery items from The W.H. Malkin Co., Limited, importers, wholesale grocers and provision merchants, for [Mrs. Siedleman]. Bill is issued on April 23, 1908. Bill for grocery items from The W.H. Malkin Co., Limited, importers, wholesale grocers and provision merchants, for [Mrs. Siedleman] of Cedar Cove. Bill is issued on April 8, 1908.